Fans anxious for word on the “The Hobbit: An Unexpected Journey Extended Edition,” can officially check off calendar dates, Warner Bros. has released the Kracken — or at least the dates when it will release what is expected to be a monster on home video. In the U.S. Tuesday, Nov., 5 is the street date available for the film with its 13 extra minutes of footage edited and scored directly into the film. That means customers can walk in and buy it off the shelf or, as more often is the case with big title releases, look for it from home delivery after buying it online or pick it up from the outlet where they have placed a pre-order. Those purchasing a digital download can have it much sooner, October 22nd (likely a world-wide availability date.) 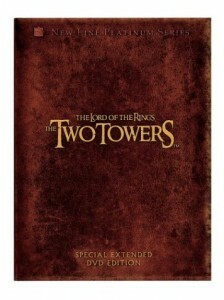 International street dates vary, but it is believed Nov. 4 is the date for the U.K..
Each of the three films in Jackson’s “Lord of the Rings,” trilogy received a deluxe Extended Edition treatment around November after a December theatrical release and for many fans those longer cuts of the films are the definitive versions. Also widely loved are the extras on those editions which stand, even for non-Tolkien / Jackson fans, as among the elite extras on any film ever released. With the deflation of the home video market, extras on film releases are definitely trending downward in quality and quantity as studios see less or no return on the investment to put added value on the discs but that does not seem to be the case here. The same team behind those releases (which were ported unchanged to Blu-ray) have done the work here to tell the story behind first The Hobbit film with an announced “nearly nine hours” of content. They also shot and produced the video blogs that Jackson has posted on his personal Facebook page during the production of the films directly to fans and which served as the extras for the theatrical home video release of the films. The press release announcing the extra content on the Extended Edition of the film not only boasts nine hours of content but an audio commentary from director, producer and screenwriter Jackson and Philippa Boyens who earned a co-producer and screenwriting credit on the films. The extras are described as “The Appendices – A multi-part chronological history of the filming of The Hobbit: An Unexpected Journey.” This fits in with the LOTR discs and how they were titled, which bodes wellfor them fitting as an entire package. The released box art of the EEs is not what many readers of TheOneRing.net hoped for. Nothing is exactly wrong with the shot of Bilbo Baggins holding his sword Sting and looking a bit worried against a generic forest background, but it feels standard and bland on a version of the film that consumers want to be special. Each of the LOTR films was a different solid color with the film’s title in gold with appropriate and subtle Tolkien-esque markings around the box. In fact, the packaging was virtually flawless for those films, matching the high standard of content. A non-staff story about this subject was posted just this week. In fairness, those titles were a different studio’s release (part of New Line Cinema’s Platinum Series) and this is a different commercial era for home video. With a declining market it is easy to see why a studio would want any consumer, especially casual ones, to know immediately what film they are looking at on a store shelf. However, these Extended Editions may well get lost among the regular editions instead of stand out as distinct and prestigious. This writer doesn’t speak for TORn, but I am disappointed. Still, it is a solid bet that viewers are much more concerned with what is on the inside of the box and call it a hunch, with the production video blogs setting the standard, this content will delight consumers. This is a good time for the public to demonstrate to film studios how much we do care about excellent content to go with fan-favorite films on home video releases. If sales aren’t stellar, who knows what the fate of the next two films’ extended editions might be. 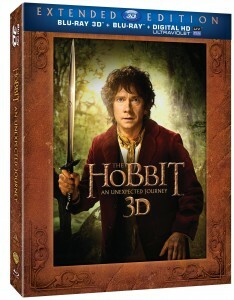 TheOneRing.net will review the Extended Edition and the added content as soon as it becomes available to us. We will also keep readers updated with different added-value incentives from big retailers, if any are available. The entire press release is presented below after a clip from the extended edition. The first of a trilogy of films adapting the enduringly popular masterpiece The Hobbit, “The Hobbit: An Unexpected Journey” was nominated for three Academy Awards®1. 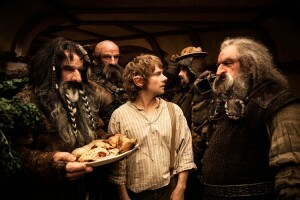 The Hobbit: An Unexpected Journey is the first in Peter Jackson’s highly anticipated trilogy adapting the enduringly popular masterpiece The Hobbit, by J.R.R. Tolkien. Here, alone with Gollum, on the shores of an underground lake, the unassuming Bilbo Baggins not only discovers depths of ingenuity and courage that surprise even him; he also gains possession of Gollum’s “precious” ring that holds unexpected and useful qualities…A simple, gold ring that is tied to the fate of all Middle-earth in ways Bilbo cannot begin to know.